Vice President & CEO, Astir Palace Vouliagmenis S.A.
Mr Stelios Koutsovitis took the position of the Chief Executive Officer, as an executive member of the Board of Astir Palace Vouliagmeni, on July 20, 2017. Mr Koutsovitis has an international professional experience in tourism and real estate, with a significant know-how, in the fields of asset management, investments and hotel unit operation. 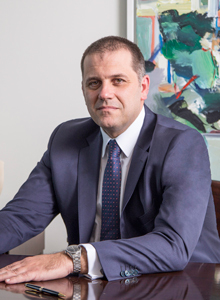 During his career, Mr Koutsovitis held managerial positions in G&T Daskalantonakis Group. He was the Managing Director of the stock exchange listed company Sofia Hotel Balkan (Bulgaria) and the Executive Manager of the city hotels group (Greece). He holds a degree in Computer Science, a master’s degree in Business Administration from the Economic University of Athens and an MBA from the Columbia University.